In 1973, Mike Cowan was working in a bank in Odessa, TX. Born and raised in an “oil town” as the son of an oilman, Mike had been exposed to the energy business all of his life. One day he was presented with an opportunity to broker a deal on rig equipment, and Mike resigned from the bank the day after the deal closed. 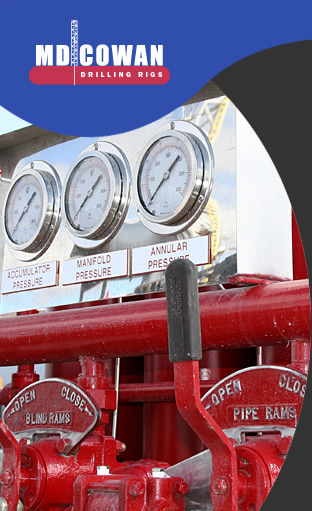 MD Cowan, Inc. was born and ever since then, has proudly served the oil & gas industry. Through the years MD Cowan, Inc. has brokered equipment, sold drill bits, and owned drilling rigs. In late 2004, the used equipment market was drying up and MD Cowan, Inc. seized the opportunity to begin constructing a new SUPER SINGLE DRILLING RIG®. Since the first rig hit the field, the order book has been full. The 1,000 horsepower SUPER SINGLE DRILLING RIG® hit a sweet spot in the market and has been a huge success. Customers like the rig for its drilling capabilities while bundling the rig in highly mobile packages, a combination that fulfills most of the needs in today’s drilling business. MD Cowan, Inc. is an agile company and can leverage their resources to seize market opportunities. The company is committed to serving the oil & gas business with outstanding quality and service – ideals that will keep MD Cowan at the forefront of the rig equipment business.